It's baffling, maddening, difficult, violent, obscene, over-indulgent, under-edited and way too long, but 2666  a number that appears nowhere in the actual book  is also the best novel of the year. 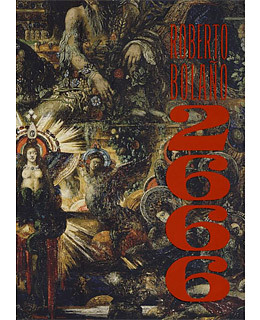 The two central plots of 2666 are, very loosely speaking, the life story of an enigmatic German novelist called Archimboldi, and a murder mystery about the killings of hundreds of women in and around a seedy Mexican town called Santa Teresa. But only two of the book's five sections (2666 is a bit like Dante's hell, in five easy circles) deal with those stories directly. Packed with red herrings and digressions and leads that lead nowhere, 2666 is a work of anger and anarchy that laughs bitterly at the idea of tidy resolutions. It's like a Borges story that exploded. But beneath the chaos is a fanatical order, the desperate artistry of a genius scribbling as his life ran out  Bolaño died of liver disease in Spain in 2003.